I imagine that many of us have plans for Thanksgiving. We probably have some picture in our minds of where we are going, and who will be there, and maybe even what food we will eat. And if you don’t yet know how you will be spending this coming Thursday, I would not be surprised if that caused a little anxiety. This is the way of holiday traditions; the stories and images, memories and expectations of “what Thanksgiving looks like” layer and harden like that magic shell ice cream topping. So I would suggest that actually, most of us don’t really know “what we’re doing” for Thanksgiving this Thursday. Like the family in our children’s story, we may have expectations of turkey, salad, mashed potatoes and pie, but the reality may be something else. The family in the story made an amazing about-face from a thanksgiving dinner which could easily be called disappointing, and might be called “ruined” to embracing the reality of the situation and being present with one another in that radically unexpected reality. I think we’ve all had our expectations dashed at one holiday or another. I don’t have a lot of extended family, so even if Gramma and Grampa and Uncle Don and our friend Mr. Hockenberry were all there for Thanksgiving dinner when I was growing up, it wasn’t a big crowd. But even on years when it was Mom and Dad and Me and my sister, mom would still get out all the good china and the heirloom serving dishes and work for 2 days to make all the traditional dishes from scratch, and then we would sit down to… well, just us, but tired and grumpy from having cooked for 2 days. 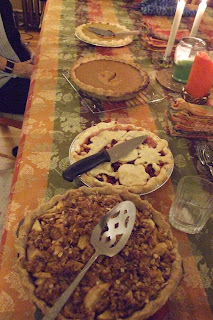 I can still remember the feeling of emptiness after one such dinner- not even home-made pumpkin pie with whipped cream from scratch served on the fancy china could fill the hole left by Gramma and Grampa, could fill the hole between my expectation- that Thanksgiving is a holiday for extended family, and lively conversation and visitors – and my reality, that it was just us 4, and we were all a little sad and grumpy. One of Homo sapiens’ special gifts is our capacity to imagine a future we can’t see. It helps us store up food for the winter, it helped us invent the smart phone, and it helps us plan a Thanksgiving dinner. Our expectations help us function as a culture. The grocery store or local farmer’s market expects that I will give them money in exchange for my thanksgiving groceries. I expect that I will open up my home to family and friends for dinner, and I expect when I go to dinner as a guest I will bring a bottle of wine or a sweet potato casserole. This happens hundreds of times every day that we don’t notice- Sun rose in the morning- check. Car still out front where I parked it- check. Other drivers stopped at the red light- check. So we are actually pretty good at knowing what to expect, but when our expectations are confounded, when our expectations are different from the reality of the present moment, we have choices to make. Imagine 2 meandering paths running alongside one another, sometimes side by side, sometimes crossing, and sometimes diverging widely. One is the story we are telling ourselves about how our day is going to go, about how our life should go, about what we are doing for thanksgiving. The other line is our actual lived reality. I often don’t even notice how much I have my eyes glued to the path that represents my expectations. I am so invested in that path that when reality diverges, I will cling with all my might to the path of expectation, waiting for reality to meet our expectations, striving to bend reality back into union with our expectation, instead of joining reality where it is. We choose which path to take in every moment. For example, this summer I went to see one of my favorite bands, the Decembrists. It was a sold out show, and I looked forward to it for weeks. As we walked to the theater I was so full of excitement I said to my husband “I can’t believe this is actually happening!” The band started with some new songs I didn’t know, and the lead singer was having some trouble with his gear. (Never use a wireless pick up- said my husband from the seat next to me- they always fail when you need them) The crowd was restless, and during the quiet moments in the music would whistle or hoot or yell out requests. Everyone could kind of tell that things were not going according to plan. I, ever the optimist, was determined to hang on to the vision I had in my head. This was going to be great- it would be great any moment. Finally as they played one of my favorite songs and I still didn’t feel that ebullient joy I had expected to feel, the light dawned. We had all had a certain expectation about what this show would be- what this very expensive, much anticipated, sold out show would be, would feel like, and the reality was something different. Suddenly it occurred to me- if I wasn’t enjoying the show, I might as well practice mindfulness- the practice of constantly returning my attention to the reality of this moment we are actually living in right now. Right then and there, I began trying to bring my attention into the present moment. It resisted. I tried again. “But,” said the part of me so attached to my expectation, “if really let go of my vision and embrace reality I’d have to admit I am disappointed.” Okay. I thought. Let’s do it. I believe in reality, I believe there is a benefit to being in the present moment, let’s give it a try. A wave of sadness rose up in the space between me and the present moment -- almost like a wall dividing my expectations from reality. I was going to have to pass through that wall of sadness; I was going to have to grieve or somehow release my expectations. Okay, that’s another practice I’ve been working on- to let myself feel whatever I’m actually feeling. So I entered that feeling of disappointment. As I did, I thought- why do we go to live shows? They will never be as perfect as the tracks meticulously layed down and recorded on the album. We go to live shows because we want to witness the reality of these musicians, these human beings in the flesh, making music for and with us. The reality is that making music is hard. Sometimes your gear doesn’t work, sometimes the crowd hoots in the quiet parts, and doesn’t like your new songs. Sometimes it’s the first night of your tour, and things don’t go as you planned. The reason to go to a live show is to share a totally unique moment that has never happened before and will never happen again. And finally I dropped into the reality of that present moment. It was actually a pretty good moment. Let’s take a pause now, together, to arrive in this moment. One way to do this is just to start with something small, like your hands. If you put your hands on your legs, you can feel the air across the back of your hands. You can feel the warmth of your legs under your hands. You can feel the reality of your hands, right now in this unique moment. Notice whatever arises with a non-judgmental compassionate awareness… When your mind wanders off, just notice and gently bring it back… back here to this moment…Back here to the lived reality of the moment we are sharing together. First of all, I spend very little time in the present moment. Apparently I focus most of my attention planning for and anticipating the future. Second, trying harder doesn’t seem to help. If I’m “trying” I’ve created a story about what “should” happen, a goal to strive for. The goal is on that “expectation” path, dividing my attention from what is really happening. All I can do is notice what I’m thinking, notice what I’m feeling, and gently allow my attention to come back to this present moment whenever that is available to me. The present moment can seem like a shy kitten who will go hide if it feels pursued, but might come sit near you if you just wait quietly and patiently. Third, it helps if I start with the premise that I can’t do it wrong. If I notice I have expectations that I SHOULD be able to be in the present moment, and I begin evaluating and judging and analyzing myself, now I’m even further from the present moment than when I started, that kitten is hiding in the attic by now. But if I notice my expectations and feelings and thoughts non-judgmentally, without expectation, without trying to decide if they are right or wrong, if I just notice them with compassion and curiosity, I increase my availability to reality. Because even the thought “this is lame and difficult, this shouldn’t be so hard” is a real thought, if that is indeed what is arising, so noticing it non-judgmentally allows us to stay on the path of reality. Fourth, just because it doesn’t feel good doesn’t mean you’re doing it wrong. If you are trying to be present with the reality that you are lying in bed with the flu, you are still going to feel whatever symptoms your body is feeling. But if you notice and then let go your expectation that you SHOULD be at work, or whatever you were expecting to be doing right now instead of this, you may notice something shift in how you feel. It might feel freer, lighter, not as overwhelming, but don’t take my word for it, I don’t want to create expectations about how things might change- it will be different every time. Fourth- reality is pretty interesting. I like to practice paying attention to reality when I’m bored, because I’m always saying I don’t have enough time for my spiritual practice, so why not use some scrap of time I’ve already labeled as boring? Moreover, I’ve found that I sometimes I feel bored because I EXPECT to be bored. I assume waiting in line at the grocery store is boring, that being stuck in traffic will be boring, but if I get curious about this moment, there’s often a lot going on in my body, my mind, my feelings, or in the world around me. That boredom might be a barrier between me and a really interesting moment I might have missed. Or it might be a barrier I put up because underneath I was starting to feel something challenging, a restlessness, a sadness, a frustration. I will leap out of my own experience of lived reality onto that other path- the path of expectation and imagination, as an escape from feeling that thing that might be difficult. Why stay present with a difficult moment? Because reality always wins. We can escape momentarily into our imaginings of what Thanksgiving dinner should be, but if this is the year when everyone is a bit sad because Pop Pop’s not there, I believe there is a value to letting that sadness be part of our time together. In my experience, when I’m able to feel the reality of a moment that is difficult, instead of flying away from it in my mind to an alternate timeline where this moment is not sad, I free up a lot of energy I was using to keep my expectations alive. Now I can invest that energy in this real moment we are living. And if it’s a difficult moment, maybe that energy could be useful for healing, for connecting, for choosing navigating the moment with integrity and wisdom. If I decide to open myself up to the reality of the present moment, I no longer have to manufacture a wall to hide from the parts of reality that contradict my expectations. Please don’t confuse reality with what I used to call “realism.” After being disappointed so many times, I cynically decided that I would always expect the worst, and then I could be presently surprised. This is the other side of the same coin however. If we always expect the worst, we may be more available for unpleasant experiences, but we may close ourselves off to what our heart really wants. Something beautiful and unexpected might happen, but our magic shell of expectations keeps us from being open to the experience. 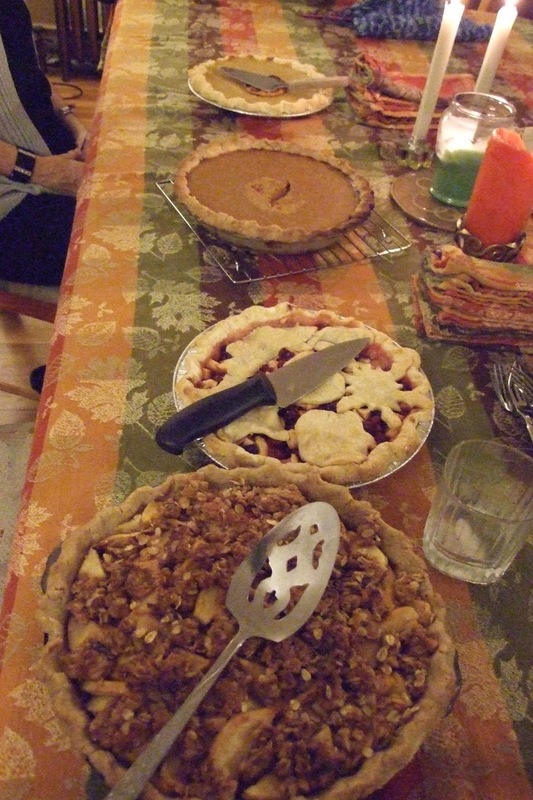 What are you doing this Thanksgiving? Allow whatever pictures and feelings come to mind to come, and just notice those expectations, give them a smile. Probably you are right about a lot of that, but inevitably reality will also contain something unexpected. As we move into the holiday season, I invite you to notice, with a non-judgmental compassionate awareness, when expectations and reality diverge. Let us hold our expectations loosely where we are able, and look for opportunities to be present with reality as it is unfolding, because that is where life is.